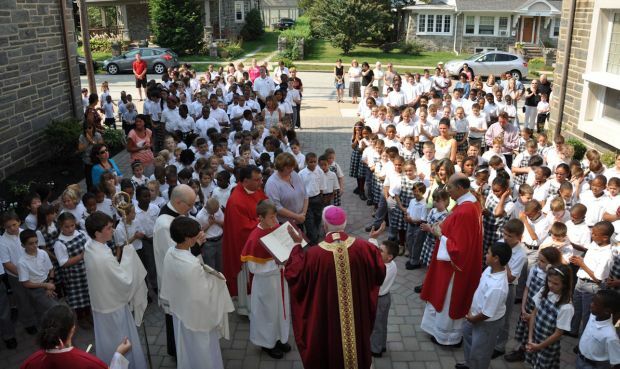 Bishop Daniel Thomas leads the blessing rite for students and staff of St. Andrew School, Drexel Hill, as he dedicates the primary building the Father Joseph McShain Building on Sept. 11. Bishop Thomas accepts the offertory gifts from students at St. Andrew Church Sept. 11 to formally begin the new school year. The students of St. Andrew School in Drexel Hill went back to school last week like other kids around the Archdiocese of Philadelphia. 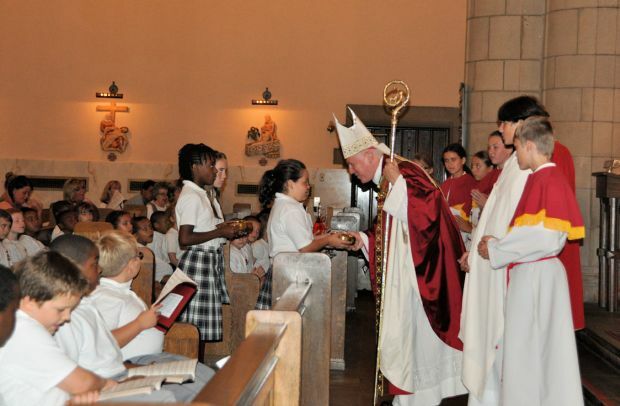 St. Andrew’s also kicked off the new year formally and, for a Catholic school, properly with Mass Sept. 11 in the parish church, celebrated by Bishop Daniel E. Thomas. After Mass he led a blessing and dedication ceremonies at the two renovated school buildings on the campus. More than 400 students, faculty, administrators and some parents worshiped in the Gothic-style St. Andrew Church led by their pastor, Msgr. Albin Grous, who invited them and the bishop to share in “the task of love which is the mission of Catholic education,” he said. In his homily, Bishop Thomas introduced the children to the word “excelsior,” a Latin term meaning “go higher.” He implored them not only to seek higher grades in school, higher scores in sports and, with a nod to the pastor, higher fundraising goals for the school, but on higher spiritual goals. Following Mass on the warm, sunny morning, a procession of all the students led the bishop out of church and behind it to the courtyard of the primary school building for a blessing rite. The new courtyard featured landscaped stone pavers, flowers and a cast bronze statue depicting two children reading next to a globe. It was the most visible sign of improvements begun last summer. In addition to the main entrance at the courtyard, administrative offices and kindergarten and pre-K classrooms also were renovated. Bishop Thomas dedicated the Father Joseph McShain Building in honor of the parish’s founding pastor. Today the primary school contains classrooms for grades pre-K to three, plus administrative offices, Lab Learner science lab, computer lab, music room, art room, gymnasium and nurse’s office. The parish’s upper-level school across the street from the church also was dedicated by Bishop Thomas as the Father John Hughes Building, in honor of the parish’s second pastor. In addition to containing the parish hall (doubling as the school lunch room) and St. Katherine Drexel Conference Room for the parish, the building hosts students in grades four through eight, who also use the labs, gym and specialty rooms at the primary campus. The renovations totaled $24,500, and parish business manager Steve Litz said 60 percent of it, or $15,000, was financed by a benefactor in the parish. Over the past three years in fact, St. Andrew’s has been upgrading roofs and heating boilers. Today all the buildings of the parish that was founded in 1916, including the church, are more energy efficient and use only clean-burning natural gas. Boilers, air conditioning systems and roofing work are not normally visible to parishioners, but the new courtyard puts all those improvements into focus. “It is nice to finally have an attractive, impressive and welcoming capital project that can actually be seen and enjoyed by all,” Litz said. Improvements don’t normally happen without parishioners working together and making sacrifices to support the parish and its school. St. Andrew’s takes stewardship seriously, according to parish leaders. A biannual 20-page newsletter is produced for school alumni and parishioners are encouraged to support the school’s annual appeal campaign. 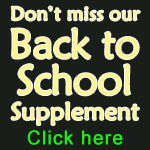 St. Andrew’s enrollment stands at 357 this year. That is an increase of 64 percent since 2009. At a time when many Catholic schools are adopting the regional model over the traditional parish school, McLean attributes the success of St. Andrew’s to leadership.